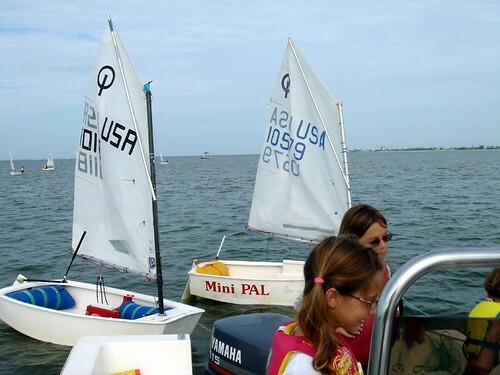 M. had her first full regatta this weekend. 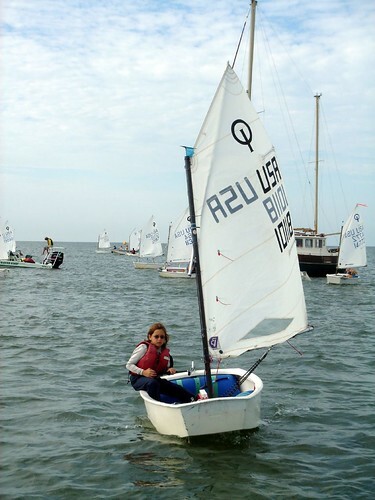 She'd sailed one race in this regatta, finishing last, and didn't sail the rest of the regatta so I'd pretty much forgotten all about that one, so really this weekend was her first regatta ... at least in my mind! 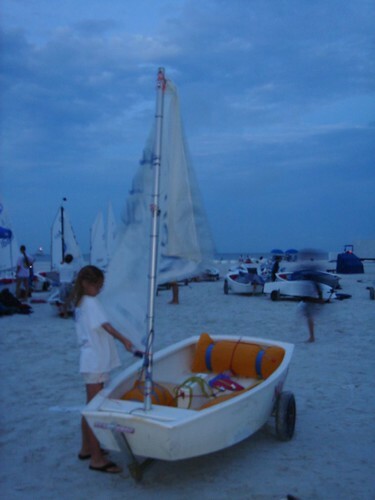 The best thing ever for her and I. was getting to rig their boats in the dark. They had to use flashlights. Really, most of the rigging was done after it was light enough to see but I made sure we got onto that beach in the dark, they were so excited for it, and really, it was pretty cool. Very serene, seeing the little flashlights everywhere and hearing nothing but the rustling of sails. Well worth getting up at 6:00 a.m. (not that I'm volunteering to do it again in the near future). 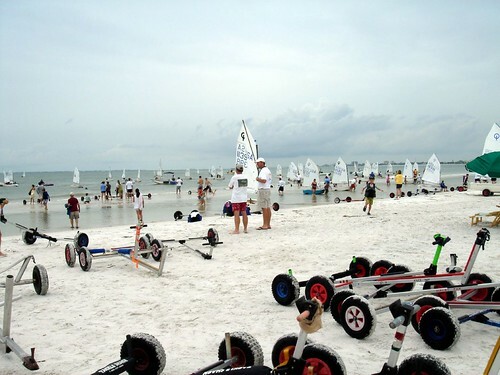 The best thing for me was seeing the whole regatta experience from the eyes of a "freshman" sailor. C. has been racing for over 4 years, and I. for over 2, so I'd forgotten how exciting everything can be. M. picked her goodie bag apart piece by piece, oohing and aahing over every single thing in the bag ... and there were some oohing and aahing things in their - most notably flashlights and whistles. She was nervous to go out for the first time, especially into the gulf with the waves near the shore, but showed no fear when the time game and just went for it. 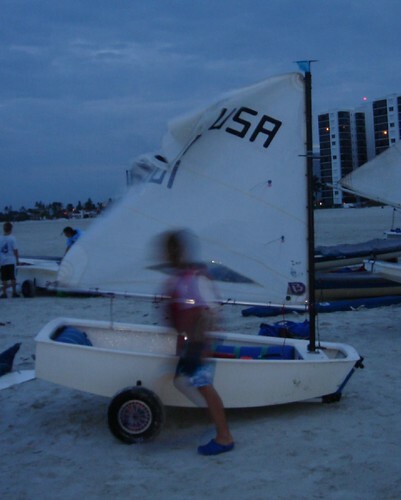 I. was one of the first kids in his group rigged and each day he was one of the first kids on the water. It took no prompting or reminding from me, definately some maturing going on there. 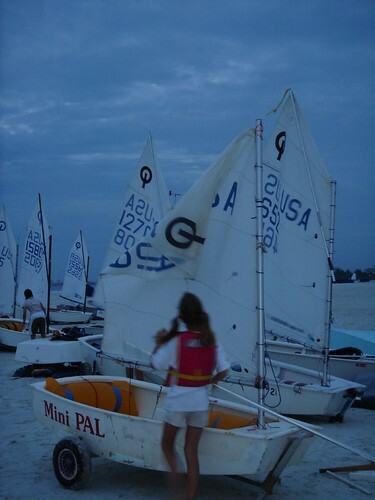 The first day of sailing the weather wasn't cooperative so I. and M.'s fleet only got two races in. The second day was much better, with 4 races completed. Jason, A., and I got to hang out on a boat and watch the sailing up close. 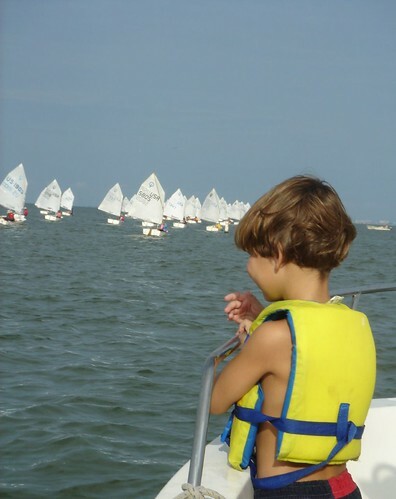 It's rare that Jason gets to go to a regatta with us so it was really nice for him to see the kids sail. One race, we see M. go around the first mark but haven't yet seen I. Suddenly Jason calls out that I. is right next to M. and I need to take pictures. I start snapping away, then look up to realize that isn't I. at all ... it's some other kid with hair just like his and a life jacket the same color. We all get a laugh out of it. After the race has ended I see the kid whose picture is now all over our camera and I realize it's a girl. Now, I. 's hair has been an issue lately with me realizing that he really does look like a girl in boys clothes and we may need to do something about it. So now we're all laughing, not only has Jason mistaken him for another kid, but it's a girl ... Then we talk to M., who says, "Oh, I know who that is. Her name is Moose." For some reason we were all laughing hysterically about the whole thing. A few minor problems ... M. somehow didn't realize a race had begun so she got a late start, I. was over the course start and had to go back and restart a race, causing him to lose a few places. 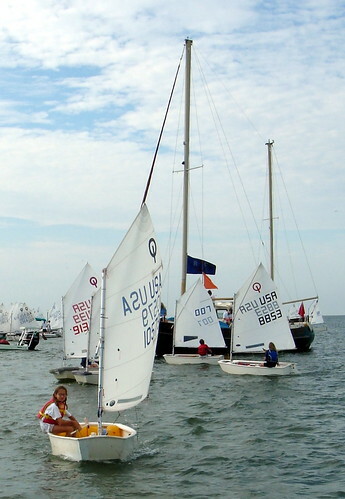 M. finished in 63rd place, out of 95 boats. That's a great result for a first regatta. She's thrilled, and we're really proud of her. I. finished 22nd of 95. He was hoping for a higher finish but he had some great races and showed incredible improvements over last year, and we're very pleased with how well he did. He seems to be finding his place on the race course and appears to be enjoying racing more this year. Overall, a successful weekend. The kids are tired and ready for a good night's sleep, and are already talking about their next regatta. What an awesome hobby! It sure looks like the kids had fun. And I bet it's much more fun to watch than baseball or football. What a gorgeous day to be outside! Congrats to all!